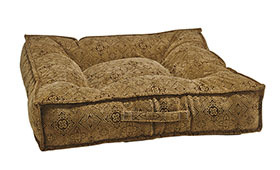 Bowsers Piazza Beds have a tufted square fiber topped foam center cushion with plush overstuffed outer bolsters. The Piazza captures the sleek, space saving modern design of traditional flat cushions with the added security and comfort of removable bolsters. The cover features a convenient carry handle and is completely removable for washing and drying.